The Apple iPhone may not be THE smartphone to have in China, but it does have a presence in the country, and it seems that Chinese users of the iPhone have been experiencing some network issues. In particular, the iPhone 5S and iPhone 5C have been reported to encounter problems related to the network when being used in China. 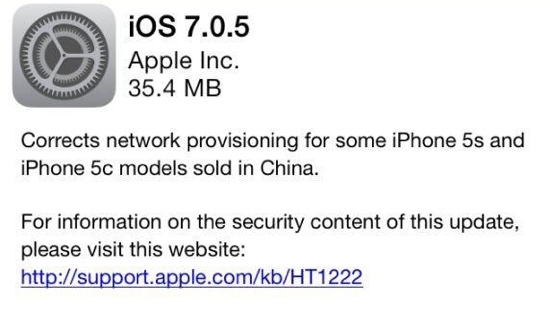 Apple was quick to address this issue, and it has released iOS 7.0.5. It is a minor update, but for those who have been banging their heads on the wall because of network issues, this update is definitely critical. Interestingly, this iOS update comes very soon after the iPhone was launched in China, with no less than Tim Cook himself handing out the first China Mobile iPhone. Yup, they’re serious about gaining a foothold in China. Who wouldn’t want that anyway?